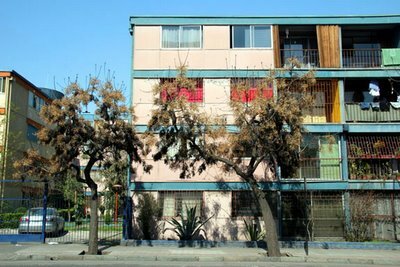 We live in a cluster of buildings situated around a couple of adjoining patios. While there is a church immediately next door to the complex, and the girls say their prayers before meals and attend catechism classes, I don't know if the hogar is funded privately or through the government. In comparison to other hogares, I believe that we are very fortunate, and have access to all of our essentials and even more. Still, however, resources are scarce. The cheerfully painted walls around the patio brighten the look of the place, but there is still a lot of pain and anger. Those in charge of the hogar believe in keeping the girls occupied, which definitely helps with their behaviors and attitudes. We clean multiple times a day, and everyone shares in the daily maintenance of our lives here. The tias are the bosses here, we have two day tias and two night tias. 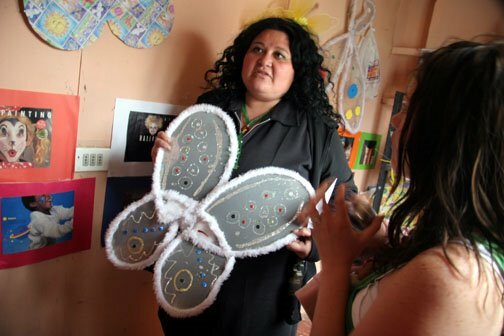 Each shift lasts 12 hours and consists of everything one might need to do to raise 26 girls. Needless to say, they are quite busy. The girls look to us volunteers for social, cultural, recreational, and supplemental educational projects. Our website outlines many of our current projects, but we are always starting new ones as more volunteers arrive with fresh energy and ideas. One of our biggest projects is called Liga de Futbol and organizes soccer tournaments in which teams from different hogars can play against one another. 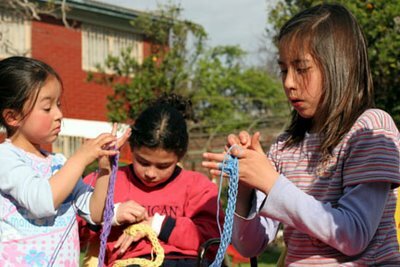 This program is important because not only does it give these children a chance to leave their hogar for a full Saturday of fun (with a meal included) but they also can meet other children from other hogars and experience healthy competition and teamwork. The girls at San Francisco de Regis love to play soccer, but I had heard that they never win any games. 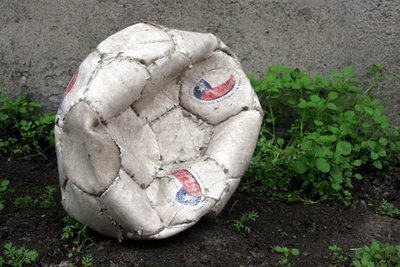 I found out why the other day: this is their only soccer ball. I dug it out of a closet, deflated, and the girls immediately gathered around me to play with it. I told them after lunch I would go to the gas station to fill the ball, or pelota, up with air, and they could barely contain their excitement. You can imagine how I felt when the worker at the closest gas station told me there was a hole in the ball, that he couldn't inflate it. I had to walk back to the girls and tell them I would explain the rules of soccer to them another day, when we had a better ball. They looked at me as if they had heard this all before. Luckily we do have some supplies in a closet here in our set of rooms on the complex. I found a few balls of yarn, and while I'd rather teach the girls to crochet or something more useful, we only had yarn at this point. So I decided to teach them fingerknitting instead. 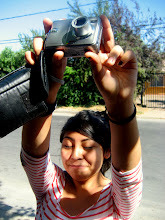 The first girl to learn, I will call her Ana, told me that she didn't think that she would be able to do it. Ana is a bit shy, and being maybe 9 years old, a little awkward. She insisted she would not be able to learn. Lena and I sat with her, and within minutes she insisted she didn't need our help. Other girls came and went, fingerknitting as long as their rather short attention spans, but Ana sat in the sun in her chair all afternoon, intent on finishing the whole ball of yarn. And when she did, and the other girls poured compliments over her finished piece, she couldn't stop smiling. While September 18th might be the day Chile officially celebrates its independence day, the days of the month leading up to it are filled with anticipation and preparation: Cueca, the traditional national music and dance, is played in every store and colectivo (cars with specific routes where buses don't go), flags are sold at nearly every intersection, and empanadas become even more abundant. On the 18th itself the city center becomes a bundle of enclosed outdoor party areas with rather steep entrance fees-- inside you can purchase more traditional food and watch performers dancing Cueca. 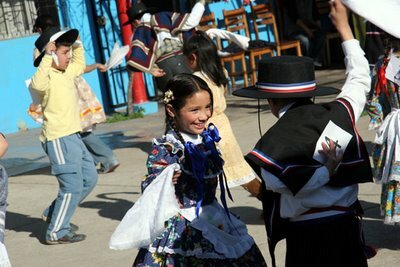 In the neighborhoods, or comunas, you can find bars and parties where, whether in costume or not, Cueca has taken over. Regardless of where you are, you will be haunted by the smell of asado, as Chileans barbecue enormous amounts of their favorite meats in their backyards and on the streets. 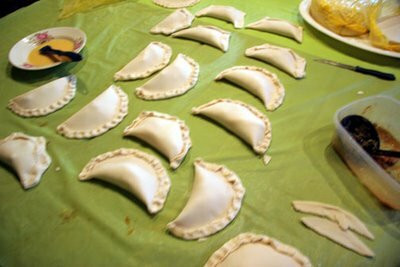 Fortunately I was at Domingo Savio before the kids arrived, and I helped make the dozens of empanadas we would need for the party. I'm not sure how they make the dough, as it was already prepared, but inside you will find meat cooked with spices and onions, a quarter of a boiled egg, and one black olive. Tia Olga kept reminding us to press harder as we assembled them, as they have a tendency to open up as they bake. I wish I could tell you how they tasted (vegetarian...)-- I know that the kids really liked them! Orientation week officially ended on Sunday, as we all moved into our own living situations, but due to Monday being September 11th our directors decided to have us stay out of the city center and attend an all day English teaching workshop headed by WorldTeach. 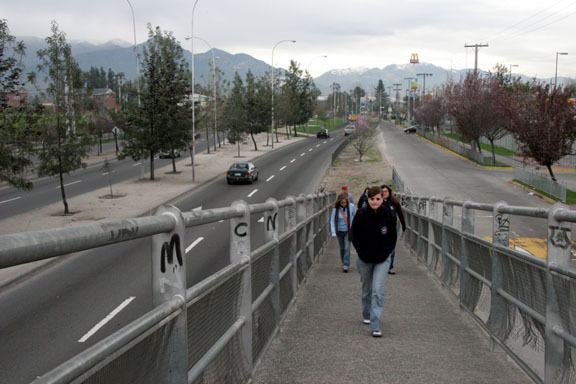 September 11th in the United States might refer to the attack on the Twin Towers in New York, but here in Santiago de Chile the same date might recall memories of the 1973 coup and the beginning of General Pinochet's Reign of Terror. Lena and I didn't know the micros, or buses, would stop running quite as early as they did on Monday, and thus waited to find a cab for a few hours. Luckily the cab driver didn't charge us too much extra to get us home safely, despite a few minor fires in the streets. Most of the protest action took place far away from where we were going, and many people stayed inside this year as not only was it the anniversary of the coup, but this year it was also the 20th anniversary of the asassination attempt on Pinochet. For more information on Chile, Augusto Pinochet or Salvador Allende, and the coup of 1973 I recommend starting with the BBC's country profile on Chile. Meanwhile I put up some photos from orientation week, and you can see them here. Even though we've only known each other for one week, the 17 members of the Class of Septiembre 2006 have spent nearly every second together-- especially since we were all staying at the hostel together. We are even passing around the same persistent cold / sore throat, and I cannot wait for it to start getting warmer. True, when the sun is out and directly hitting you, it can get quite warm. But in the shade and at night, it becomes so cold I can't stop shaking (there's no heat). I think my body is in shock and protesting my clothes-packing decisions. The good news is that the next 5 days will be full of festivities as Chile prepares to celebrate its independence day on September 18th. Monday is sure to be full of street parties and shows, with the traditional music, dance (Cueca), and food already saturating every moment of the entire month of September. Work at the institutions has begun. I am working at San Francisco de Regis along with Lena. The Catholic run home is in charge of 30 girls from ages 4-15. We will be providing activities in music, dance, futbal, art and art history, and hopefully! digital photography. Fortunately there are computers onsite, which is one step closer to successfully implementing the digital photography program so many people have helped me build. I am currently working on the lesson plans, and will keep updates of our progress. Until then, besos. Orientation week is now in full swing. 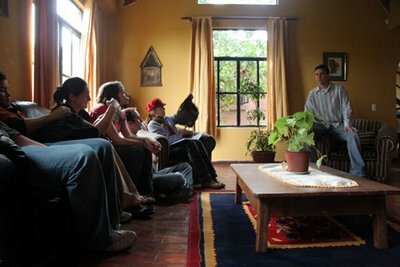 This past Sunday all volunteers had finally arrived at La Casa Roja, the backpackers hostel in which we are living for the week. After making a trip to the local grocery store, we tested our teamwork in preparing dinner for all of us in the huge communal kitchen here. While I have eaten in some cafés and restaurants here, I have only tried a few dishes. Already I can tell that I will be eating more avocado, or "palta," than I probably have in my whole life up until this point. But I'm ok with that, since you can find variety in the items on which you put the palta: here, palta can even go on pizza. We decided to stick with pasta, since there is a whole aisle of it here in the grocery store, but if you are particular about your pasta sauce you may find the tomato to sugar ratio in the Chilean version of pasta sauce rather staggering. The way that VE is structured, a new "class" of volunteers arrives every three months. Participants may leave after the first three months, or they can stay for as long as they would like thereafter. Most people stay between 3-12 months, depending on what they have time for and what they can afford. The first week you are in Santiago is thus your orientation week which is hosted by the any current volunteers and is a collage of meetings, presentations, games, tours, talks and meals. Monday morning we began this very full, intense week. I have a feeling that my days here might quite possibly be full and intense for the entire duration of the trip. 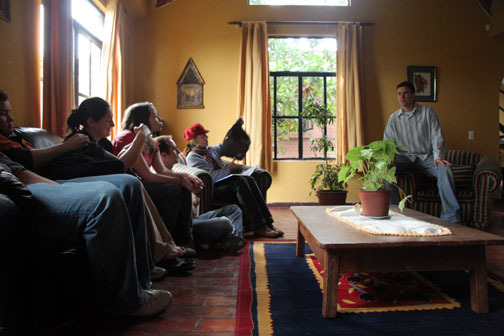 As of halfway through this orientation, we have visited 2 hogars, or homes, shared small group and large group meals, participated in many games including a scavenger hunt around Santiago, met with the directors of the centers in which we will be working, and engaged in many stimulating discussions about what we are trying to do here. Here we are at the Casa Grande, or Hogar Esperanza, with Luke about to present Jorge Daveggio. Jorge is the director of this hogar, and the instigator of the foundation. We gathered in the living room and he told us the story of why he founded this place when he was only 19. He had a job when he was 18 where he was around kids his own age and younger, and he would see them pick through the garbage to look for food. But everyday after work, he would go home to his family and food would be ready for him on the table. The injustice struck him so deeply that he and two friends founded this private home with the mission being to raise the children there as if they were their own. 25 years later, Jorge is still playing father to the kids at Hogar Esperanza, or Shelter of Hope. He imparted realistic and sincere advice, encouraging us to be positive, proactive, humble, and determined. I feel very comfortable knowing that he has made himself available at any time to any one for questions or discussions-- there is much to learn from him. During orientation week, we are divided into small groups of new volunteers led by one current volunteer. Throughout the week the small groups visit other hogars or centers so that we have a better understanding of the scope of VE, as the network of organizations with which it works is very wide in range. 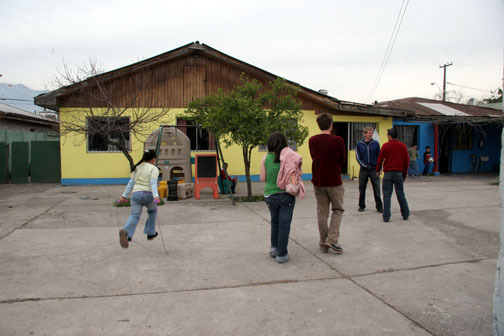 My group's first visit was to Club Domingo Savio, a community center that has existed in some capacity for over 20 years. While Domingo Savio used to be a live-in home, now it is called a "Club" and acts as more of a preventative force in the at-risk community in which it is found. 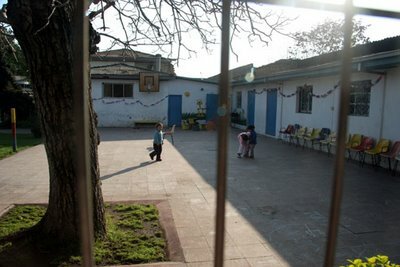 D.Savio is funded completely privately, and even though it's resources are still very limited, the positive energy in its classrooms and playground fights hard against the hard reality of the children who work and play there. The volunteers assist and support the strong permanent staff of the Club, and they are the only ones who actually sleep in the modest building. Many of the children who are a part of D.Savio have single mothers who work incredibly long hours, and so after a half day of school (a normal school day for most) the kids would have nowhere to go. Club D.Savio provides them with personal attention with their homework, basic lessons about right and wrong, health and hygiene, proper behavior and the like, exposure to music and theatre, and a hopeful view of the future. 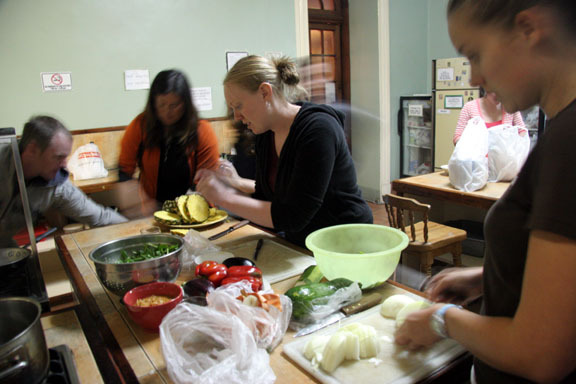 What's more, every Tuesday parents are invited in to cook in the kitchen and to see what their children have been doing. Club D.Savio costs no money to families save 1.000 pesos per month for toilet paper-- the equivalent of about $2.00. If somebody cannot pay, they can simply donate one day a month of their time to help clean the Club. Today we had the privilege of meeting with Steve Reifenburg in Harvard's office in Las Condes, a very affluent neighborhood in Santiago. Over 20 years ago he too volunteered at Santo Domingo Savio; he now focuses on international conflict resolution. Another genuine and strong leader, Steve discussed with us a wider view of Chile's socio-economic position and the role of poverty in its history. We weighed its successes against its challenges, from female presidents to a new highway that excludes citizens with its incredibly high tolls. With the education system being one of its most frustrating obstacles to date, Steve asked us stay mindful of our roles as sort of teachers in one way or another. I am anxious to see the Aldea Maria Reina, where I will be working. I have heard from other groups what it is like, and I have met the director, but a clear understanding of what I will bring to the institution is not to be had until I go. I will admit I am nervous. But even half way through orientation, I feel that I have a strong network of supporters and access to valuable advisors. Until this weekend then, cheers. With orientation starting tomorrow and only four hours of sleep supporting me due to last night's salsa dance outing, I am heading to bed directly. But the first photos of the city are up for viewing, you can see them by visiting here. I'm here. After something like 24 hours of travel-- only a couple planes, lots of waiting-- I am in Santiago de Chile with all of my luggage. The flight to Miami seemed like nothing out of the ordinary really, but during my layover in the Miami airport I began to realize that something strange was on its way. For awhile it felt odd that I was not getting up and going to work but to be honest actually it hasn't bothered me that much. Part of me believed that this was all just a farce and I would wake up and go back to being a Marketing Director again, in the cubicle, with the schedule. Saying goodbye to my mom at the airport gave me a hint, but hanging around the Miami airport, where everyone speaks a different language, secured it: I would finally be leaving the country. I couldn't be more excited to be here. The flight from Miami to Santiago proved as easy as I think an 8 1/2 hour long flight could be minus the fact that I don't think I slept more than 3 hours. Losing my luggage, a great fear of mine, thankfully did not happen. 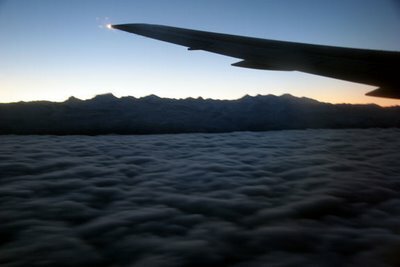 With an arrival time set at 6.40am, I approached Santiago from the north with the Andes courting the plane out my window. The sun rise pending behind the mountains created a rainbow along the horizon, and made the jagged tops looks like they were on fire. In this photo, you can see the clouds covering Santiago, nestled between the mountains here and the ocean on the other side. Three of us arrived at the airport at various times yesterday morning-- Jackie, Michelle, and myself-- with another five here this morning. And now, must meet them for an Escudo next door.